The splendid Welsh resorts of Llandudno & Conwy lie between two gorgeous beaches and have retained much of their Victorian charm. You'll enjoy spectacular views of the Great Orme, the Pier, Conwy Castle and the surrounding countryside. Hop on board with your 24 hour ticket and enjoy panoramic views from the top deck of an open top bus as you explore the two locations. Let City Sightseeing highlight all the things to do and see in these beautiful seaside towns. The North Parade is home to Llandudno Pier, a grade II listed building originally built in 1858. The marvellous structure boasts a variety of attractions, eateries and lots of things to do including a fairground at the shore end. Opposite the pier you may even catch a traditional Punch & Judy show. Stroll along the length of the pier, the longest in Wales, for spectacular sea views. Llandudno Bay itself offers picnic spots, coastal walks and stunning views. Hop off and take a trip on The Great Orme Tramway which been delighting visitors since it opened in 1902. An engineering sensation of its age, it's still the only cable-hauled tramway still operating on British public roads and has been lovingly restored. Explore Llandudno, whilst discovering the connections of Alice Liddell (the real Alice in Wonderland) who lived in the resort in the 1860s. In the heart of the Conwy stands Plas Mawr, the Great Hall, built in Tudor times. Plas Mawr is arguable the finest surviving town house of the Elizabethan era to be found anywhere in Britain. Be in awe of the Grandiose Edifice and take the opportunity to see its lavish interior. Aberconwy House is the only medieval merchants house in Conwy to have survived the turbulent history over nearly six centuries. Stroll through leafy Bodlondeb Park, a diverse and attractive park encompassing a Local Nature Reserve and traditional parkland. It commands views of the Castle, Conwy Mountain and the estuary. 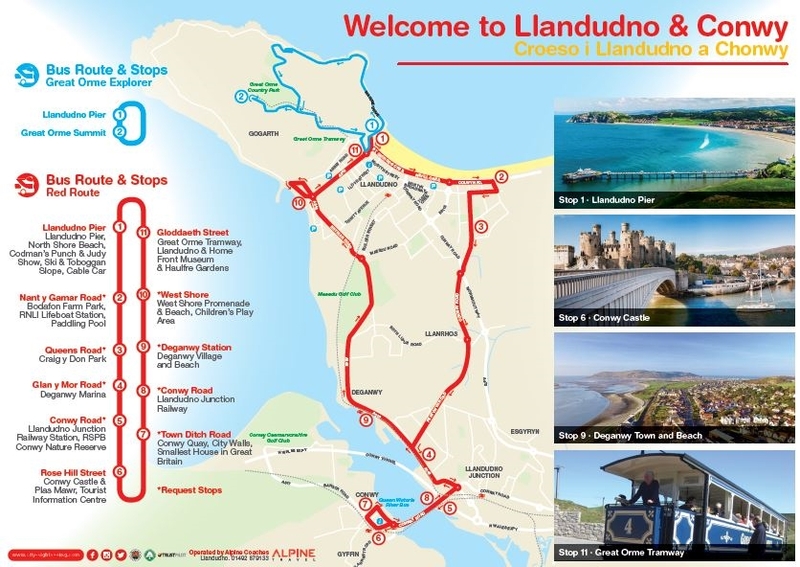 Below you will see a map of the route which is a full Hop On Hop Off service, stopping at Conwy and Llandudno with requested stops on route.